I’ll start by telling you that unless you regularly purchased Fruits de Mer Records releases throughout 2013 you can’t get this. So why am I reviewing it? I’ve grown to love this label so call it a “membership has its privileges” plug. Being a Fruits de Mer “member” simply means that if you purchase all their vinyl delights throughout the year you get an oh so awesome freebie as the end year holidays roll in. 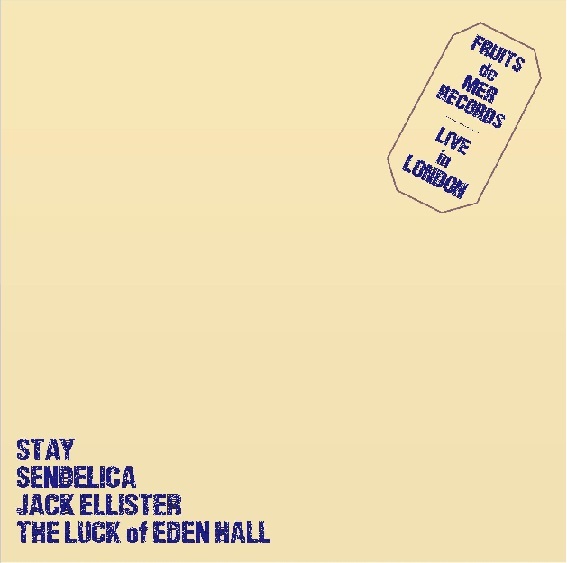 In August the label held their first ever live event – the Fruits de Mer All-Dayer, held in London and featuring Jack Ellister (Netherlands), Sendelica (Wales), The Luck Of Eden Hall (US), Stay (Spain), and headliners The Pretty Things. The members’ freebie this year is a 7″ featuring one track from all but The Pretty Things, who had to be excluded because they’ve got a live album coming out soon. Jack Ellister is a psychedelic maestro who did an acoustic set at the All-Dayer and his Old South is a lovely tune with a 70s singer-songwriter feel. Stay’s I Don’t See Myself is a swingin’ slab of R&B infused psychedelia. Sendelica’s Set The Controls For The Heart Of The Buddha is a cool rhythmic blend of trippy tribal and ethnic influences wrapped around a Pink Floyd Set The Controls For The Heart Of The Sun core. And The Luck Of Eden Hall do a feisty spaced out rockin’ cover of Pink Floyd’s Lucifer Sam. Wish I could have attended this event!